Hall Farm Barn01263 715779work01603 870304fax Self-cateringThis barn has been wonderfully restored to create a spacious and characterful property. The Sitting/Entertaining room boasts of impressive high vaulted ceilings and full length picture windows. There is a dining table for 12 and comfortable seating to retire to after eating a sumptuous meal. You could sit on the decking, over looking the herb gardens, if you wanted to dine alfresco - the perfect spot on a warm summers evening with family or friends. There are 6 bedrooms, two of which are en-suite, so there is plenty of space here to relax and unwind in. • Pets: Two well behaved dogs are welcome. Please be aware of our booking information regarding pets. 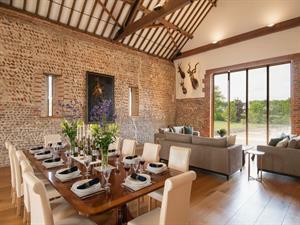 This barn has been wonderfully restored to create a spacious and characterful property. The Sitting/Entertaining room boasts of impressive high vaulted ceilings and full length picture windows. There is a dining table for 12 and comfortable seating to retire to after eating a sumptuous meal. You could sit on the decking, over looking the herb gardens, if you wanted to dine alfresco - the perfect spot on a warm summers evening with family or friends. There are 6 bedrooms, two of which are en-suite, so there is plenty of space here to relax and unwind in.